With the Civil War over, Angela Stapleton can pursue her dream of becoming a doctor. 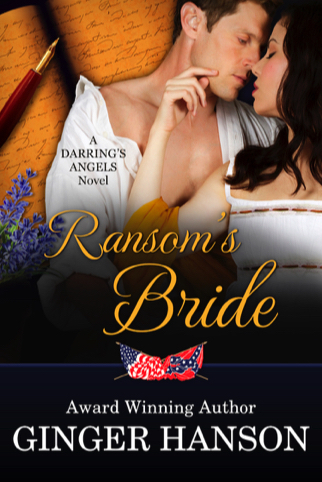 Then Ransom Champion, her deceased sister's fiancé–reported dead in battle–shows up alive. He’s come to claim the illusion created by Angela in the letters she wrote him during the war. A deathbed promise to her sister forces Angela to hide her heart as well as the truth. Ransom must never know she was his wartime correspondent. Two dreams kept Ransom alive while he was in a Federal prison–Sabrina and his ranch. He’s come to claim Sabrina, but she’s dead. And now her sister Angela is in trouble up to her beautiful gray eyes. Not only is she a former Confederate spy, but she’s been charged with murdering Sabrina. The familiar voice jolted Angela Stapleton out of her reverie. The sad moment in the family cemetery shattered into joy. Ransom Champion? Alive? Before she could turn, a pair of strong hands twirled her into an embrace. To her surprised delight, he kissed her. When his mouth swallowed her husky squeal, she rose on her toes to meet him. In the split second before her eyes fluttered shut, she stared into a pair of aquamarine eyes. Then, she closed her eyes, unwilling to see his shocked expression when he realized he kissed the wrong sister. Until he did, she wanted to soak up every sensation of her first kiss. Given by the last man she ever expected to kiss her, but the only man she had ever dreamed of kissing her. Their bodies touched from chest to thigh. She wondered if he could feel the galloping pace of her heartbeat. Wonderful sensations pooled in her abdomen and she wanted to melt into him. He smelled of cool sunshine, wood smoke, and horse, but underneath the outdoorsy mix was his scent and it made her dizzy with wanting him. She had not known a man’s beard could be that soft against her face. A dog growled at the same moment Ransom pulled his mouth free. She couldn’t stop her body from following his retreat the merest of inches. Her hands lifted in protest, she wanted to grab his head and hold his mouth against hers. She dropped her hands to her sides and opened her eyes. White teeth flashed in a grin she thought never to see again. He still gripped her shoulders. Angela didn’t think she could be any happier than at this moment. Ransom Champion was alive. She smiled back at him. “We thought you were dead.” Angela’s smile got bigger and happier. Her eyes drank in the sight of him. Sure, he looked awful because the war had etched its way across his body, leaving a gaunt stranger in its place. But he was alive! Standing before her, a flesh and blood man. Her heart soared with happiness. Thin. Bearded. War ragged. Was that a scar running along his right cheek? “I see your trusty guardian survived the war,” he said. The man who reached down to ruffle Jackson’s ears bore little resemblance to the dashing cavalry officer Sabrina had sent to war. Of his handsome Confederate uniform, only a threadbare gray frock coat, worn down cavalry boots, and slouch hat remained. His poorly mended blue trousers hovered several inches above his boots. A calico shirt that looked like peppermint candy peeked between the gaps caused by the missing buttons on his frock coat. The Yankees had ordered all the CSA buttons cut off uniforms. For some men that meant no buttons on the only coats they had left. He looked as patched together as the renewed Union. Damp February air flowed across her face, cooling her flushed skin. Less than a week earlier, a freezing cold had chased away the unusually mild winter. Now patches of snow clung in tree shadowed hollows, fighting for survival after Sunday night’s rain. She pulled her shawl closer and hunched into its warmth, corralling the urge to run her hands over his shoulders and down his arms. She wanted to feel his body beneath her fingertips. To press her hands against his chest and feel the beat of his heart. Jackson pushed his large body between them, forcing them farther apart. The dog lifted his upper lip to expose a set of yellowed, but sharp teeth. He growled again. “He remembers you. He’d be hanging off your throat if he didn’t” Angela dropped to her knees and wrapped her arms around the dog’s neck. Hugging Jackson kept her hands off Ransom. Her bonnet, knocked askew by his exuberant embrace, dangled against her shoulder blades by two frayed green ribbons. Since she didn’t trust her shaking hands to right it, she ignored the bonnet and hid her fingers in Jackson’s soft fur. The dog accepted her attention as his due, but his soulful brown eyes never left Ransom’s face. Oh my! Angela dug her fingers into Jackson’s neck. She eased her grip. How would Ransom know about Sabrina? There had been no reason to tell him, because they thought he was dead. Panic welled in her heart. She wasn’t sure she had the strength to tell him. Not yet. She smoothed her hand down Jackson’s chest, searching for some way to postpone the inevitable. “I can’t believe you’re here. Everyone said you’d been killed.” She bit off her babbling words, wondering if he noticed her anxiety, hoping he’d attribute it to shock. His small smile did funny things to her chest. “But I survived." He shrugged. His dismissal of his survival ignited a tiny ray of anger. If he’d told them he was alive, she wouldn’t be in this untenable situation of having to tell him about Sabrina. “Why didn’t you write and let us know you weren’t dead?” She’d gone from babbling to waspish. She sensed memories beneath his clipped recital that she doubted he would ever share. “Ah yes, Texas.” Angela knew Ransom’s plans because she’d been his correspondent until his presumed death two years earlier. From the first letter, she regretted agreeing to Sabrina’s scheme. Writing to a man while pretending to be someone else smacked of unforgivable deceit, but refusal had been impossible. Sabrina so seldom begged for anything. And her argument had been excellent. She had horrible penmanship and it would have been embarrassing for Ransom to see how poorly she wrote. Angela agreed to write the letters Sabrina dictated. All too soon, Sabrina grew bored with a romance conducted via sporadic letters, and Angela became Ransom’s correspondent. Although she enjoyed writing him, she never intended to fall in love. Nor had she realized the depth of her affection until they received word of his death. No one knew how much she resented her sister’s immediate search for another man to ease her supposed grief. A search that led to her own death. She stood between him and Sabrina. He hadn’t noticed the fresh grave to the side of her father’s resting place. Unable to stop the tears that welled into her eyes, she stepped aside. His body tensed as he read the inscription Angela knew by heart. His words ripped through Angela’s soul. She wanted to pull his rigid body into the warmth of her embrace, but she no longer existed for him. He had entered his own hell. The woman he loved had died weeks before his safe return. Their future lay buried in the cold Tennessee ground. As quickly as he had appeared, Ransom disappeared. The small wrought iron gate clanged shut behind him. Within moments, she heard the fading hoofbeats of his horse. Angela’s legs buckled and she sank to the ground. Her hand slid to the locket she wore around her neck. Pulling out the flat oval case, she opened it. Twin miniature portraits peered back at her. Sabrina on one side. Ransom on the other. Sabrina forever young and beautiful. Ransom forever handsome in his gray uniform. Why don’t you keep the locket, sister dear? You can pretend you’re in love with Ransom when you answer his letters. Before she died, Sabrina had made Angela promise on the locket she would never tell anyone the truth about her death. The promise had been easy to make, because Angela believed the only man who would be hurt by the truth was dead. Snapping the locket shut, she dropped it back between her breasts. Jackson flopped to the ground beside her, resting his heavy head on her thigh. Jackson sighed and settled himself more comfortably. The glade her father had chosen so many years ago to bury his first wife and their stillborn child seemed lonely now rather than peaceful. Jackson shifted his head beneath her hand to remind her he needed petting. She massaged his ears. She had never expected to be faced with telling Ransom that Sabrina was dead. It would be a long time before she forgot the bitter despair in his eyes.